Trainers are no longer just reserved for the gym. From the office to the catwalk (and even hidden under wedding dresses), trainers have become a must-have fashion staple for women of all ages. Who better to chart the history of this most comfortable form of footwear than flat shoe expert and blogger Hannah Rochell of enbrogue.com? Here Hannah picks over 40 styles of trainers - including your favourite iconic brands and some exciting collaborations - and shares her knowledge and style tips on how you can wear them and look great. From Reebok Classics to designer Dior Fusion sneakers, and from limited edition Liberty print Nike Air Max to the ubiquitous Converse All Star, flat shoes have never been more comfortable... and trainers have never been more in style. It was in Paris last week, towards the end of a long month of fashion shows, that I bumped into Hannah Rochell, the fashion features editor at InStyle. Rochell, who is better known as the flats-obsessed blogger En Brogue, was looking positively bouncy, in contrast to practically everyone else that day. That was because she was wearing her embellished trainers. So was I, and I too - even though I say it myself - had a spring in my step. These are the ultimate in happy-making shoes. Your feet feel as if they are very much on. 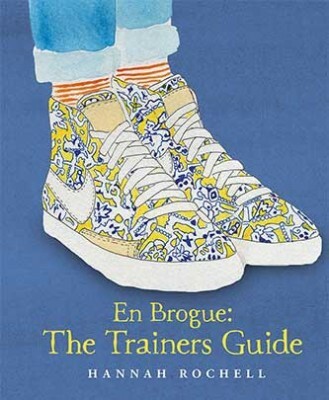 Such is the depth of feeling Rochell has for all things trainer, she has written a book on the subject, En Brogue: The Trainers Guide. It surveys an ever-growing field, from old-school Converse and Pumas to the new-fangled designer trainer world of Dior, Marni, Mary Katrantzou for adidas and more.